Ohio Zombie Apocalypse – Coming Soon | We Zombie! I might have to make a trip to Ohio this fall to visit this attraction – the Ohio Zombie Apocalypse. Overkill Entertainment is putting together a location and venue that promises to be a lot of fun. I know there are a few of these attractions in the states – Atlanta has the Atlanta Zombie Apocalypse – where you are guided through a zombie apocalypse scenario, and can experience first hand what it might be like when that day arrives. 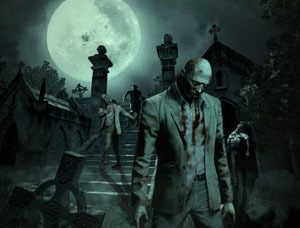 Typically, a military or civilian leader will guide you through the scene, battling zombies, running for your life, and having the wits scared out of you. I hope Overkill can pull this off – the midwest needs to practice surviving as much as the rest of the country. Here’s one of their FAQ‘s about the experience: Q: Is it scary? A: Yes, this will include zombie attacks, gunfights, zealots, survivors, ambushes, and the end of the world as we know it. So yeah its scary. I have been hearing about this for a few weeks now and cant wait for it to open. If they can deliver like they say they can this should be an awesome experience.